I’ve used running as my exercise of choice (with varying degrees of dedication) for the past 10 years, but I generally wimp out during the cold months. My runs had been super irregular this past Fall due to being over-scheduled, and not making the time, and myriad other excuses… so, mid-December I got back on it and decided I needed to make running a priority. And that, my friends, means I need gear to keep me warm-ish. We don’t have (or have room for) a treadmill, and if I have to go to a gym for exercise… well that just isn’t going to happen. I prefer solitary exercise and fresh air, so outdoor running it is. My dedication is being severely tested as of late since we’ve had several feet of snow every week since the end of January. The snow on the side of the road is currently at eye level so… yeah. Luckily, we live where snow removal is efficient and thorough, so as long as the streets are clear off I go. Anyways… a quick perusal of running gear showed me just how expensive the stuff can be. 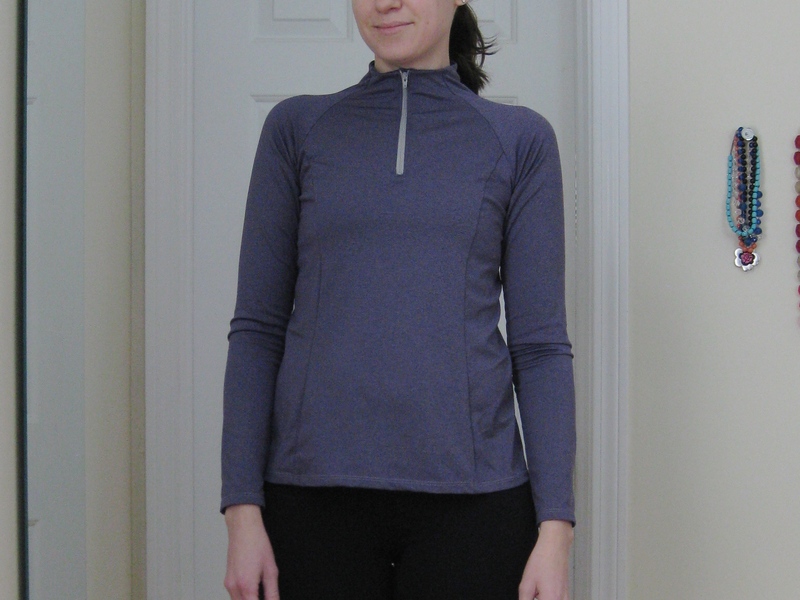 So instead I picked up some dry-wicking fabric on sale at Joanns and decided to try the Fehr Trade Surf to Summit top: a long sleeve high-necked, raglan and princess-seamed top. I cut the XS at the top, grading out to the S at the waist and hip. This pattern is designed to be fitted through the shoulders and bust, but less so at the waist and hip. I’d say that the sizing is pretty accurate, though I think I’d prefer a slightly closer fit in the waist at the back. The neck is very close fitting, as I imagine it is supposed to be, but I’m fairly sensitive to things touching my neck. While I can deal with the neck issue on this top by simply not zipping it up all the way, I’ll probably end up scooping out a regular neckline or altering the integrated collar in some way. The shoulders could use a little work as well, I feel like there is too much pulling under the arm, and a better shoulder fit may improve the neck fit as well. I think I’ll do a straight size S next time around. As far as construction goes, this was a quick top to make. The zip and placket/facing was a little dicey, and took some careful reading of directions to get right. I think the finishing on the inside ended up a little messy, and not completely as represented in the diagrams. The zipper facing is much wider than the zipper under-placket, but the facing doesn’t show up at all in the diagrams when you’re constructing the neck facing/placket. I think this could be neatened up a little, but I’ll have to work out how. If I do want another high-neck version of this top I’ll most likely make a separate neck piece or, at the very least, top stitch around the bottom edge of the neck facing. The pattern has you stitch in the ditch to secure the neck facing, but I’m not completely satisfied with that finish. 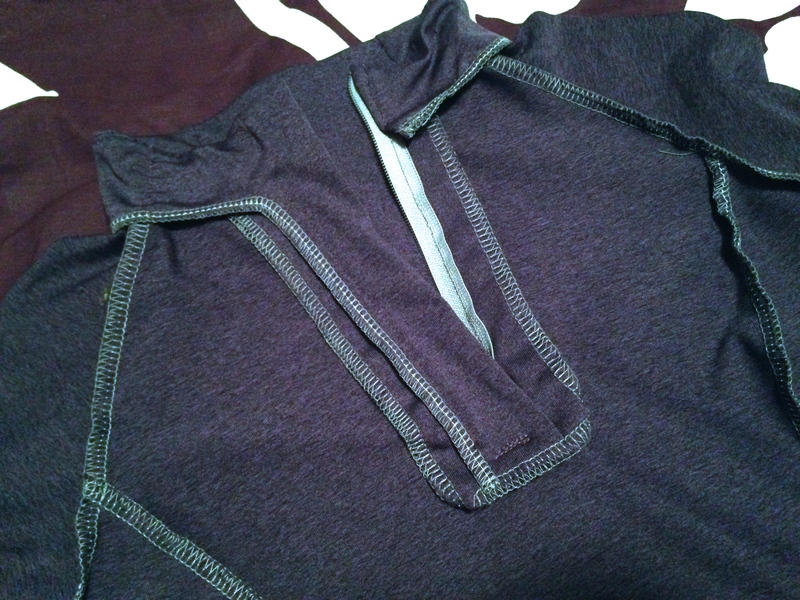 I don’t yet know much about wicking/activewear fabrics, but I won’t be buying the stuff from Joanns again. It has a slightly plastic-y feel and retains odors. None of my RTW activewear (cheap or not) has either of these issues. I know higher quality fabric exists, but I’m not sure how much money I want to spend experimenting. I’m pretty minimalist with how much running gear I own, so I’m happy to get by with only a few pieces. This top serves as a “wearable muslin” and I have been wearing it, despite my issues. Plus, this was a really fun top to sew! All the seaming is fantastic and there’s a lot of room for color-blocking, piping, top stitching, extra pockets, and so on. The jury is out as to how far down the activewear rabbit hole I’ll fall, but if the right fabric comes along it’s definitely worth the effort. How about you guys? Anyone else tempted to stitch up exercise gear?